Encryption should not provide an "unfettered space" for criminals to hide behind, FBI Director Christopher Wray said today in an interview at the RSA conference, a cybersecurity event in San Francisco. As noted by CNET, Wray said that while the FBI is not seeking backdoors in electronics, encryption needs to have limitations. "It can't be a sustainable end state for there to be an entirely unfettered space that's utterly beyond law enforcement for criminals to hide," Wray said, echoing a position that law enforcement officials have taken on encryption time and time again. Apple and other technology companies have been clashing with law enforcement agencies like the FBI and fighting anti-encryption legislation for years now. Apple's most public battle with the U.S. government was in 2016, when the Cupertino company was ordered to help the FBI unlock the iPhone used by Syed Farook, a shooter in the 2015 attacks in San Bernardino. Apple opposed the order and said that it would set a "dangerous precedent" with serious implications for the future of smartphone encryption. Apple held its ground and the U.S. government backed off after finding an alternate way to access the data on the device, but Apple is continually dealing with additional law enforcement attempts to weaken encryption. Multiple tech companies, Apple included, have formed the Reform Government Surveillance coalition to promote strong device encryption and fight against legislation calling for backdoor access into electronic devices. Apple has argued that strong encryption is essential for keeping its customers safe from hackers and other malicious entities. A backdoor created for government access would not necessarily remain in government hands and could put the company's entire customer base at risk. 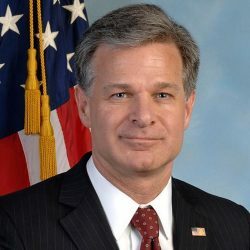 During the interview, Wray said that encryption is a "provocative subject" and he provided no additional insight into how tech companies might provide strong encryption for customers while also acquiescing to law enforcement demands for device access. Wray did say that the U.S. is seeing an uptick in threats from "various foreign adversaries" that are using criminal hackers, which suggests the need for strong encryption is greater than ever. Yes, yes we can. Doing this will only negatively affect common citizens. Agreed. Next step is regulating thoughts of the human mind; we can't have these apes thinking whatever thought just happens across their neurons! Yes we bloody can. Government has no say in my freedom. Those who value security over freedom lose both. The same principle applies online. Once you open a backdoor, its only going to be another Pandora's box. Actually we can and attempting to make encryption illegal only ensures that criminals are the only people who utilize it. Even privacy advocates recognize that strong encryption is completely dangerous to society. The idea that privacy is dangerous is lunacy, and there are other ways of collecting information than cracking encryption or using backdoors. Weakening encryption just allows governments to collect information indiscriminately on an industrial scale. I use the word 'governments', plural, advisedly. Anything the US government can crack other governments can crack as well. In other news, the FBI wants to outlaw whispering.